Tail set fairly low on body line and reaching well below hock. Carried low when standing or moving slowly, streaming out parallel to ground when at a dead run, lifted when excited, but never curled over the back. High tail set is a serious fault. 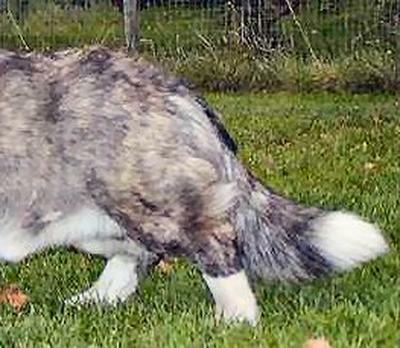 The tail is important to the Cardigan both for its functional aspect, (as it balances the dog when moving, especially at a full out gallop) and for its aesthetics, that is, how it adds or subtracts from breed type through its influence on outline. Correct outline being a key component of Cardigan breed type. Here we need to differentiate between tail CARRIAGE (how the dog uses the tail); tail SET (where the tail is placed on the body); and in yet another category, variations of tail TYPE. It should be obvious to all that dogs carry their tails in different positions. In response to this, breed standards recognize that dogs will lift their tails up when moving or when excited. The natural tail carriage of a well-set Cardigan tail may generally be low, but this is not necessarily always the case. Whereas tail-set is governed solely by genetics and is related to the physical structure of the dog, tail carriage may be influenced by attitude. We have all seen dogs in our backyards going around with tails lifted proudly who would never dream of doing so in a dog show ring. Those of us with stud dogs are all too aware that when you get a ring full of stud dogs, they are going to bring those tails up as they swagger and posture for each other as to who is the most impressive of them all. Tails can be used to indicate temperament (the shy or nervous dog who tucks his tail as you drag him around the ring), intensity (dogs at play may well carry their tail up, but when concentrating on work, drop the tail or allow it to stream out behind) and lastly, attitude. This function of tail carriage – as an indicator of temperament, intensity and attitude – is not what the standard refers to above. Rather, while recognizing the possible variation of positions in tail carriage, the standard warns against one specific carriage; curled over the back. It is this particular carriage which is deemed unacceptable. Some refer to it as a teapot tail, one which is curled over like the handle on a teapot. Some tails may even be seen to be tightly curled over the back like a typical spitz. This is what is unacceptable. Why? If you look carefully at the base of a tail carried this way, you will see that the root of the tail is usually standing straight up or even pointing forwards towards the head. This position also appears to affect the rear movement of the dog, pulling the muscles and tendons up and shortening the rear stride. This is the apparent result of a tail curled over the back, however anatomical investigation does not support this theory. Regarding the role of tail carriage in movement,the three major muscle groups which lift the tail are connected to the dorsal muscles of the back. Although they are somewhat involved in the lumbar muscle group they are not involved in any muscles of the limbs, nor do they have any appreciable involvement in gait. The several smaller muscles at the base of the tail used for wagging are mainly part of the caudal muscle grouping connected to the pelvis and are also not a part of the muscle groups which drive the rear limbs. 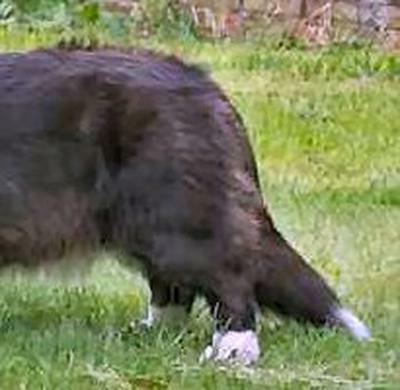 When a dog with extremely high tail carriage in combination with apparently restricted hind movement is observed, it is possibly due to the dog posturing (showing off) and therefore tensing the hindquarter muscles overall, not because the tail itself is being carried too high. There is a wide margin of variability in judging tail carriage, please recognise that. 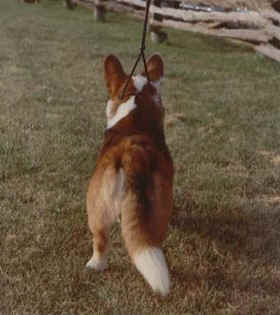 The tail may be carried low while the dog is working in the ring and reflect a sensible and stable temperament; the tail may also be clamped tightly down or carried low and tucked under in fear by dogs with incorrect, soft or nervous temperament. High tail carriage may be a sign of excitement and enjoyment, or it may be a sign of poor or aggressive temperament, the latter being as incorrect as soft, nervous or shy temperament. Tail carriage alone is not a true indication of temperament and is a minor consideration overall, unless it is so untypical (ie. curled over the back , please see "teapot-tail"on next page) that it detracts from true breed type. However, in accepting there is leeway for variable tail carriage, even with a correctly set tail, what is undesirable and untypical for the breed would be a level croup in combination with a high-set tail and the tail carried perpendicular to the level croup and curved right up and over the back. This latter configuration giving an incorrect outline to the CWC and one that is untypical of the breed. A second functional issue is the relationship between tail set and croup angle. While this is only a reflection of the actual angle of the pelvis, again it gives us a functional issue. As the pelvis rotates it influences the range of motion of the hip joint. That range of motion is limited by the shape of the ball and socket joint. If the pelvis is tilted forwards, giving a flatter angle, then the range of motion is more shallow in under-reach and greater in follow-through. If the pelvis is tilted backwards, then the range of motion is deeper in under-reach and more shallow in follow-through. A Cardigan needs a good balance between both functions – under-reach and follow-through – so that it can move efficiently and have good power in its full out run as it chases down livestock. In terms of aesthetics, the long line flowing down from the ears, neck, withers and back terminates abruptly when the tail set is too high, giving the dog a squared off look in the rear. The gentle curve over the croup and tail set called for by the standard is a much more pleasing line to the eye. Without a good understanding of the structural mechanics of the rear, however, people may inadvertently select for the wrong combination of traits in attempting to achieve that long curved line. Length of tail: The various commentaries to the standards always mention length of tail, and feathering, as issues which are important. While the standards do not stipulate the maximum length of tail they do require the tail to touch or nearly touch the ground. This refers to the fleshy part of the tail, not merely the coat. Therefore in terms of length, the Cardigan tail should at very least reach the hock joint and preferably be longer, to touch or nearly touch the ground. Tail length should be measured when the dog is standing with the tail hanging straight down and assessed as the overall length of the vertebrae, not just the length of the hair at the tip. If, when in this position, the vertebrae has to bend to accomodate the ground the tail is too long for the height of the dog. 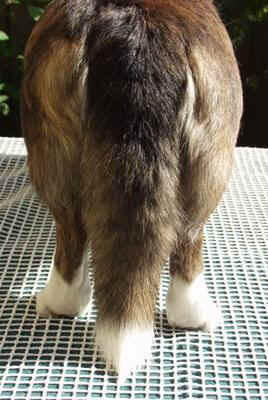 Tails can also stop short of the hocks and be too short. Please check the tails for any kind of deformation including kinks or clubbing at the tip, as these occasionally occur and should be penalized in accordance with the standard of the country where you are judging. 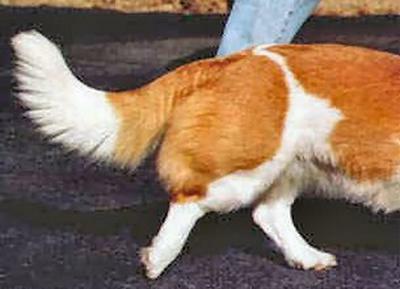 The Cardigan's tail has been described as being like a fox's brush. Noticeable in a fox's brush/tail is that the hairs are of approximately equal length all around the tail, and stand out somewhat.A Cardigan tail with noticeable feathering on the underside would therefore be considered a deviation, as would a thin, whippy tail. In closing, it must be pointed out that there is a distinct difference in the wording of the the UK and the US standards regarding the tail set. While in practice there seems to be little difference in what breeders and judges from around the globe actually select, nonetheless please note the differences in actual wording. Taken literally, the UK standard would seem to prefer a slightly higher tail set than the US standard. Tail of correct length (moderately long, to touch or nearly touch ground" UK, "reaching well below hock" US). Brush appears correct, and set on is acceptable.Carriage cannot be determined here. Tail of correct set, showing the soft flowing Length as described previously, is correct and it has a pleasing brush. Carriage cannot be determined here.